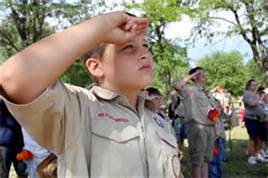 What To Say to Boy Scouts ?? You have just heard three readings from Holy Scripture. They may seem strange to you because they aren’t about things that people you know talk about… the readings don’t have anything to do with TV programs or video games… but I tell you Scouts and Scout Masters and parents — the words of Scripture are the most important things we can be involved with, second only to Mass and the Sacraments of the Catholic Church. So let me start this way — last Sunday was the feast of Corpus Christi – the feast in the Church which honors Jesus present in the Eucharist. That day, the Gospel started with these words: “Jesus spoke to the crowds about the kingdom of God, and he healed those who needed to be cured.” And then it went on to talk about Jesus feeding 5,000 and more people from just a small amount of bread and fish. But for these kind of readings to mean something to you – you’ve got to believe in God… you’ve got to believe that God has the power to do anything — He even has power over the sun and the moon and stars… He has power over illness and death. Now I hardly ever do what I’m about to do. I brought two things with me that I’d like to give to one of you Scouts to look at with your brother scouts sometime during this week that you’re here. I have two sheets of paper – each is printed on two sides. One sheet has miracles associated with the Eucharist – the Holy Communion in which Jesus is present. One miracle tells of drops of Precious Blood coming from a consecrated host… the other tells of the face of Jesus appearing on the Host. It may seem like things that happened a long time ago and you wonder whether it’s true. And so I brought something a little more recent. 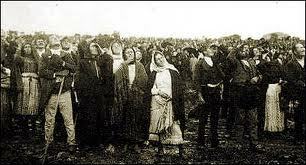 The second sheet is the story of the Miracle of the Sun which happened in Fatima in Portugal. That miracle was witnessed by about 70,000 people at a place where Blessed Virgin Mary was appearing… and in that sheet that I’ll give you – you can see many of the pilgrims staring up at the miracle of the sun. Okay — so what is this about? It’s about faith being real to you. It’s about Jesus being real to you. It’s about things like the old testament story you heard in which a man of God named Elijah being so powerful a man of prayer — so favored by God that Elijah’s prayer was heard and the son of a widow lady was raised from the dead. And that story points to Jesus whom we heard about in the Gospel. The very voice and command of Jesus was enough to bring the son of a widow lady back from the dead. You’ve got to hear this. You’ve got to believe. Because if you don’t know about God… if you don’t know about His power and will — then all this stuff about coming to Church… about priests and deacons and odd looking clothes — all of it won’t have meaning for you until you know Jesus… until you come to love Him… until you come to be on fire and in friendship with Him. And then to begin to love His Church. Now I want to say a few more words about the power of God and about miracles. Well, I’ll start with miracles. Why does God do some of the things that He does? Why would he raise that young son of a widow lady and not all the dead children of those days? None of us knows the mind of God. He can draw goodness…. good results out of the worst situations. But death is a result of sin in the world and so there is and will be death until we are raised from the dead and our bodies reunited with our souls. So we need to stop trying to control God by telling Him that this person or that person needs to be healed or raised from the dead… what we ought to pray for is for God’s will to be done – but let’s not be afraid to share with God what’s on our minds and hearts. And the other thing I want to say about miracles is this: If God could utter His word and create the universe… if God can form man and woman out of the dust of the ground or the rib of a man… if Jesus can raise people from the dead – then Jesus can surely make Himself present — totally present hidden in the form of bread and wine. So don’t believe that this Host that I’ve brought is just a symbol – it is truly Jesus. The same Jesus who walked the earth 2,000 years ago, who cured blindness and leprosy and raised people from the dead. He wants to have union with you. Personal relationship with you in Holy Communion. After a few prayers – practicingCatholics can receive the Eucharist – and we can all pray to have our faith strengthened… to grow in love for God and others.